Bottom Line: If you’re into cool toys that have functionality, give this a try but don’t rely on it outside of simple tasks, such as deathmatches. Didn’t you ever wish that you could just sit back and browse the web like it’s made to be done? Didn’t you just want to lie back and make your eyes do the talking and clicking for you? Well then, if you’re like me, you will be looking for everything possible to make your time on the computer and on the internet, much more efficient and easier. As an American, I like doing things the easiest way possible. People have dreamed for a long time for something to make using the computer easier. When the mouse came along, that was a godsend and people were gracing it as the ultimate usability tool for the computer but now that we’ve progressed through high stages of computing, the mouse has remained relatively the same except for some laser technology. 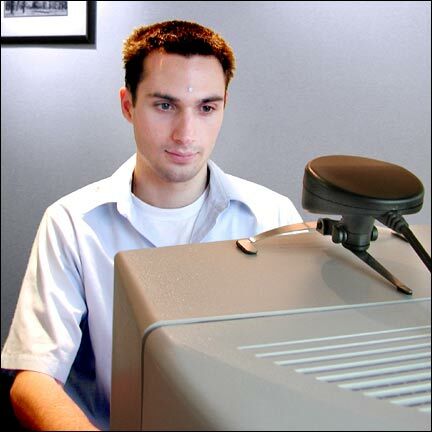 In comes the NaturalPoint TrackIR, which is a tool which supplements "not replaces" your mouse with something much better... your forehead. The concept is so simple that it’s almost a crime to market and sell it off when most of us has been dreaming of things like this for years but to give credit where credit is due, NaturalPoint took it upon themselves to actually take the time to developing something like this and market it. Here’s how it works, the TrackIR has 2 basic parts that make it work. The first is a camera that mounts on the top of your computer and second part is silver dots which you stick on your forehead, hat, etc… that catch the attention of the camera so that the cursor moves along to the movements your head makes. The dots have a cloth backing so you can stick it and remove it many times. The camera is sensitive enough to detect the silver dots and it will only detect those dots and calculate how it moves and translate it to cursor movements. So when the dots are on your head and you move your head left, the camera sees the dot moving to the left and therefore the cursor moves left. Actually, this isn’t really a camera because all it can basically make out from everything else is the silver dots; it will not do anything like take pictures of your friends or of the city. The camera sends out infrared signals and the silver dots bounce the signals back to the TrackIR. The camera is connected to the desktop or laptop through USB. The cable is pretty short (good for laptops) and therefore it comes with a 4 foot long USB cable extension. Also, it has extra rubber pads for use with laptops. A good feature of this is that the device is powered by the USB port and therefore doesn’t require any external power. The device comes in three flavors: the "standard" which has the camera, cord, software, and the dots...the "EG" (ergonomics) which has a clear case camera, two finger rings, and a breakout cable, this is meant to fully replace your mouse… and finally, the “AT” (assisted technology) model which helps out disabled people with special software. What I will be reviewing today will be the standard model. When getting ready to install the device, you will see many, many notices in the packaging telling you to install the software before installing the hardware and this is a very important factor in getting this to work properly. I would’ve gone and tested what would happen if I installed the hardware first but I don’t think that I would like to have taken that risk. After installing the software, you will need to reboot, then connect the hardware to the computer. The camera was meant to sit on a monitor or something pretty high up and level to your head or wherever you wish to place the dots. The camera has a metal base which can be bent to stabilize itself on any surface: monitor edges, desk edges, etc...The camera has a roughly 25 degree field of view which is quite adequate because it will most likely be positioned in front of you. Installation was fairly simple and straightforward, just like many USB webcams and devices. Of course here comes the tricky part or so it seemed: the software. The TrackIR doesn’t work at all without the software running because it is not a native windows device like a mouse or a keyboard but making the software run on start-up isn’t a big hassle. You’ll know when the device is on and working when you see the green light on the top of the camera turns on. The software works with everything in the system and is basically like one of the apps everyone used to have that would move your mouse around a bit every couple of seconds to fool the AllAdvantage program. When you move the real mouse, it would disable the TrackIR program until the mouse stops moving. The software itself reminds me of the mouse control panel in Windows, it lets you control cursor speed, sensitivity, smoothness, etc...Smoothness is unique, when you set it to maximum smoothness, you get a very fluid movement from the cursor but also it seems to lag a bit...I like it because your head can be shaking quite a bit and the cursor would be steady, sort of like the Sony Handycam’s Steadyshot. In constrast, minimum smoothness results in jerky and jittery movements of the cursor. Other functions include a double speed function in which the cursor moves at double the speed. Also, the gravity function lets you hit the hard to hit targets of the close, minimize, maximize, etc...buttons, they snap to a button when the cursor gets close to it so you can easily get the cursor close to the close button and the software automatically positions the cursor over the close button, where it thinks you intended to put it. The "Game Mode" function overrides the game’s mouse controls so the TrackIR can be used for games. But in games, I found that precision and speed is lacking compared to a mouse and it would pretty difficult to be a champion while using the TrackIR as a game controller. These comments are for FPS and RTS games but for flight simulations, I’ve come to the conclusions from many reports that this is a good choice because of the ability for you to view out of the cockpit with the TrackIR and how it’s a less point and click dependant genre than FPS or RTS. At this point you might be wondering how you click the mouse, both left and right click can’t be done with your eyes blinking, I’m sorry but I don’t think that function will ever be implemented, unless you would like to stick a few silver dots on your eyelids. Clicking is done through pressing designated keys on the keyboard, so you can have an almost hands free experience, notice the keyword being "almost". What can I say about this device in terms of things I normally do such as browsing the web and checking email? The TrackIR can easily move the cursor as well as a mouse can and it’s much easier moving your head than it is moving a mouse so I cant argue with it’s ease and laziness factor. The only major problem that I think people will hit is that it takes time getting used to it. It takes time to adjust to the speed you move your head, the angles of visibility, and the range, and if you play games, those too. Also, the TrackIR catches onto many things that are bright...not just the silver dots. If you have a silver ring, there’s a good chance it’ll see that as a dot and track according to that. The bottom line is that you probably wont save any time by using the TrackIR but it’s a good break from the standard mouse and also adds just a little bit to the human laziness factor. I’ll give it to you, it’s pretty cool to say that all you have to do to use your computer is look at the screen and move your head around a bit but considering everything up to this point, is it worth it? It would be if you could get 100% used to using the TrackIR but it’s harder than it seems but the sensitivity and speed options do help. NaturalPoint has done a good job programming the software so that it makes the user have an easier time getting adjusted to the TrackIR. 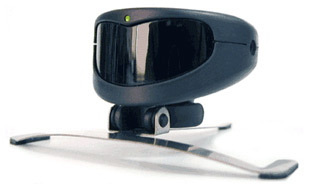 Once properly modified, the TrackIR can be one cool toy but it probably will not be put out for mainstream use or adopted by any OEM’s because overally, it will take longer to do things with the TrackIR then it will with a simple mouse. If you’re into cool toys that have functionality, give this a try but don’t rely on it outside of simple tasks, such as deathmatches.